"Gotta Go Feed The Horses." Please come join my Facebook page to post, blog, add videos and learn more about clicker training horses. This is a great site with LOTS of good information. I have teamed up with Laurie Fredrika Higgins to offer an ongoing training site, with a great library of resources and training help. You can also read Peggy Hogan's personal journal about the process of owning and Clicker Training Horses in this blog. Peggy's minis have expanded their training to include working for charity and fundraising functions. It is a WONDERFUL way of combining clicker training horses with outreach. 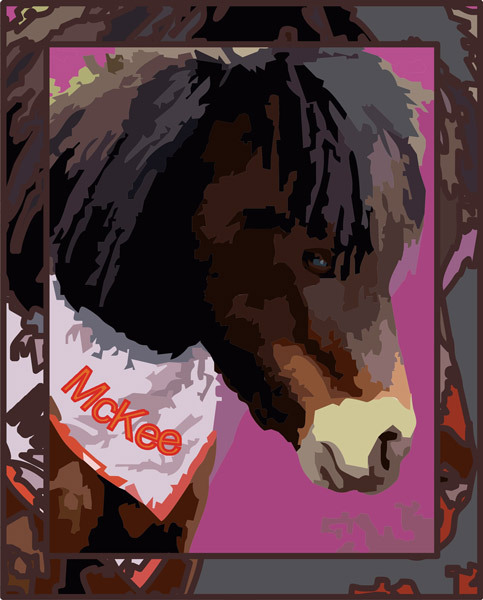 Be sure to catch "Mini McKee" and his latest efforts and learning to paint. He has a gallery of pictures that are for sale, and the proceeds go towards adding more visits with the horses. Handsome is another mini who is contributing to mankind by annually ringing the bell for the Salvation Army. Watch for his schedule each holiday season. Connected Riding teaches you to ride from the inside (by feeling), to the outside (by action). It provides you with an awareness of body and movement that empowers you to move in harmony with the horse. It teaches you how to influence the horse's movement through an elastic connection, allowing you to let go of compressive, energy-draining techniques. Through a series of ground and mounted exercises, it shows you how to use the rhythm of your own body to lead your horse to enhanced performance. Twice grammy nominated, hit songwriter Mary Ann Kennedy, writes and performs songs from the heart about horses and the animals we love. Listen & Ride to this Inspiring Music! Mary Ann wrote and performed the song: "Gotta go feed the horses" on her album "The Trail Less Traveled." I am grateful to Mary Ann and her generous offer to let me have her music in my entertaining videos. Fresh Music - Exceptional Quality and Value in Production Music since 1990 - Thank you, Bob!